"...thanks to your company and... thanks for the good service you have provided. The department has just purchased our fourth radar unit since the year 2000. All radar units have worked great and are still being used. Hope to continue a good working relationship with you and your company." Bill Wansley, Chief of police, Quitman, TX. The Phantom Patrol is a moving and stationary traffic radar system offering a combination of high performance PLUS low cost. The Phantom Patrol gives you more range, easy to read displays, wider patrol range and straight forward, intuitive, controls that are as easy to use as they are durable. identification. Just by pressing and holding the Lock switch the speed radar searches for the highest speed and displays it. Releasing the Lock switch freezes the highest speed in the Lock window and finds the speeding motorist amongst the other traffic. 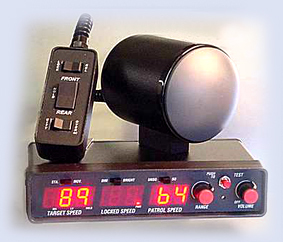 This function is frequently an “extra” in other speed radars costing $100.00 or more. It comes as a standard feature with the Phantom Patrol. The Phantom Patrol speed radar is also tough! The extruded aluminum & nylon coated steel chassis makes this one of the most durable speed radars in its class. 15 MPH thru 199 MPH, not exceeding 208 MPH closing. Target detection distance: Approx. 3500 ft..
Readouts .56" high brightness Algas.